The online, hyper connected world can be a scary place. This can be especially true when entering the fray from a business perspective, where the intent is to cultivate interest so that revenue generation can result to some degree or another. One tool that has received significant buzz online is The Conversation Prism. What is The Conversation Prism? The answer to that question is debatable, although the most clear-cut answer comes from its creator, Brian Solis, who says that it “helps chart online conversations between the people that populate communities as well as the networks that connect the Social Web.” What does this mean? How can we trust his perspective on this issue? I wonder about the answers to those very questions. Either Solis is a rather insightful individual regarding the social media landscape or he knows how to talk himself up very well online. This maybe particularly so when you consider he has established his career based upon this information visualization. I think that the attempt made by The Conversation Prism to provide a level of basic understanding to communication relationships is a noble one, however I do not completely agree with it. One of the most glaring problems is the coloration used throughout the visualization. Several classmates noted this during classes this week, opining that the colors simply serve to dress up the diagram at the cost of diluting the message. Since the diagram roughly takes the shape of a flower, why is it that some “petals” are warmer colors such as red, orange and yellow while others are cool colors like variations of blue and greens? Do these stipulate differences in user interactivity levels of the mediums contained within these “petals”? Had I been in charge of crafting a similar model, while maintaining the general guise of Solis’ creation, I would have done away with the color pallet, instead vesting interest in a uniform neutral background for every portion of The Conversation Prism. In this sense, there would be little or no suggestion that one area of the Prism is more dynamic, active etc. than any others. The Conversation Prism is an interesting tool but I think it has served most poignantly as a self-promotion lightning rod for Solis. In the world that exists today, change is constant. In turn, a visual such as this will not remain up-to-date unless it is changed constantly. There are much too many social media communication channels and tools to account for and summarizing their supposed relationships in one crafty graphic is not realistic. The Conversation Prism is a resource of note but should not be used as a primary representation of online communications today. A better grasp of these complexities comes from hard work and first-hand experience in your own field. Having a poster of the Prism hanging on your office wall may look nice but trust your gut when it comes to making strategic decisions in the online space. I can assure you that self-promotion has nothing to do with the inspiration behind this or any other work I publish. I completely understand what you’re saying however…The truth is that this work is reflective of a year of research and organization and it’s as complicated as it is visual. 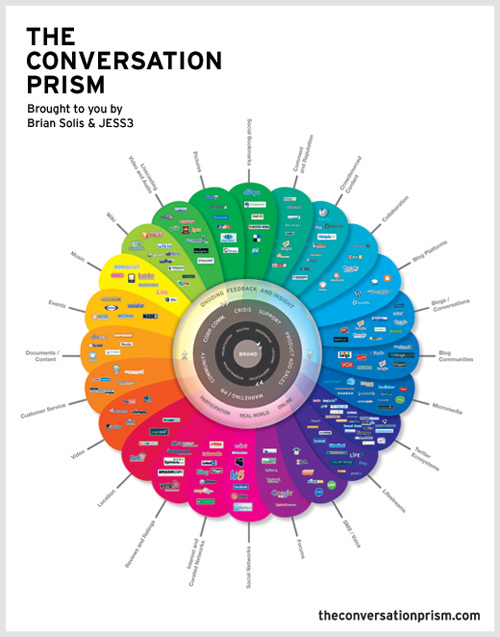 Initially, the Conversation Prism (conversationprism.com) was designed as a map of the social web to remind experts that there is more to the proverbial conversation than Twitter and Facebook. What’s missing in this post however, is the keystone to the prism and the main reason why we had to write a pseudo instruction manual for it…people tend to take graphics at face value without necessarily seeing the bigger picture. These two posts instruct any brand on how to listen using the prism to define a specific social map that creates a detailed and accurate index and set of directions on where to focus specifically. It quantifies the gut feeling. Each brand map, as a result, will differ. This is about focus and identifying paths to influence by understanding everything from relevant communities to sentiment to opportunities for influence. For a visual example of a conversation or communications network based on the research using the Conversation Prism as a source/guide, please see these images: http://is.gd/4c8nQ and http://is.gd/4c8Ht (I call this the human network as it represents influential communities and individuals and how they connect to each other – which is always cross network, not necessarily bound by any one place or time). Your post and the reply are exemplary of the conversations we can have online to stimulate each other’s thinking and inspire ourselves to new knowledge and a better understanding of one another. I hope you’ll contact Solis and express your gratitude for his thoughtful answer. You might even want to write a follow posting yourself after you have reviewed the material he suggests you read. Great for you to understand that we are all visible and all part of the conversation in the world of Web 2.0 and beyond!